Shown in camo and ivory flowers, this wedding garter set includes a keepsake garter and toss garter. 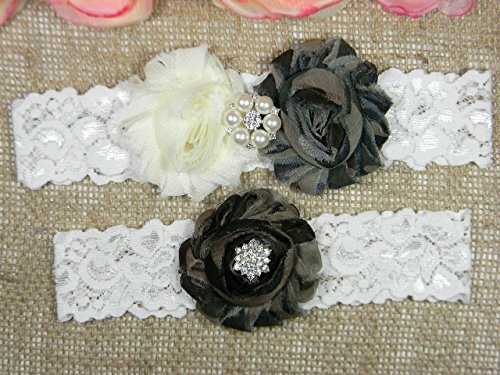 Pearl and rhinestone style lace garters have shabby chiffon flowers in the colors of your choice (see color chart in pictures). Both garters are made with pretty 1 1/2" light ivory/off white stretch lace and come in a gift box. Each garter is handmade with attention to every detail for your special day! *"*♥*"* HOW TO TAKE YOUR THIGH MEASUREMENT: Use a soft measuring tape around your thigh where you want to wear your main keepsake garter, usually 5-6 inches above the knee. If you don't have a soft measuring tape, use a string to measure and then hold the string against a ruler to get the measurement. Take your exact thigh measurement, making sure not to pull the tape or string too tight. Do not take off any inches, I will deduct the necessary amount. Each garter is made to fit your chosen size, so please measure carefully to ensure a proper fit. PLEASE NOTE: since items are custom made to order, no returns are offered. If you have any questions, please contact PCB! If you have any questions about this product by PCB Studio, contact us by completing and submitting the form below. If you are looking for a specif part number, please include it with your message.